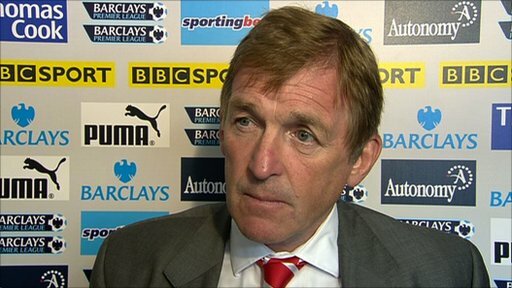 Nine-man Liverpool were embarrassed at White Hart Lane as Tottenham cruised to a 4-0 win. 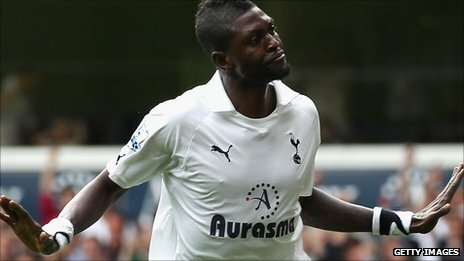 Emmanuel Adebayor scored twice on his home debut, with Luka Modric and Jermain Defoe netting after Charlie Adam and Martin Skrtel were sent off. Croatian Modric curled home brilliantly from 25 yards on seven minutes. On 65 minutes, Defoe made it two before Jose Reina's mistake two minutes later allowed Adebayor to poke home. He then made it four with the final kick. It was Liverpool's second successive defeat following their 1-0 loss at Stoke, while Tottenham are now unbeaten in three since losing 5-1 to Manchester City. Their return to form coincided with Modric being close to his best. Chelsea offered a reported £40m for the midfielder over the summer and he missed his side's 3-0 defeat to Manchester United last month. But he was part of a Tottenham midfield that completely dominated Liverpool's. Even before Modric scored, Kenny Dalglish's team were lucky to still be level after Adebayor stabbed wide on three minutes from Niko Kranjcar's flick through. Liverpool's regular right-backs Glen Johnson and Martin Kelly were both out injured and stand-in Skrtel struggled to contain Gareth Bale. The Welshman got in behind the Slovak four times in the first 15 minutes, with Adam and Skrtel both booked for tackles on the winger. Liverpool thought they were level on 18 minutes when Adam's header bounced around the edge of the area and landed at Andy Carroll's feet. The England striker slipped it through to Luis Suarez, who toe-poked home, only to be flagged offside. Sebastian Coates made his debut on 27 minutes, replacing Daniel Agger who was injured during the scramble for Modric's goal. But one minute later, Adam was sent off by referee Mike Jones after a second yellow card for catching Scott Parker above the knee 25 yards out. It was reminiscent of Adam's tackle on Bale when playing for Blackpool last May, which left the Tottenham man out for the season with a ruptured ankle ligament. Coates' first significant moment in a Reds shirt was hauling down Adebayor 25 yards out, resulting in a yellow card. Liverpool's frustration showed as Luis Suarez was booked for sarcastically applauding the assistant referee on half-time. Things got even worse after the restart however. Tottenham continued to have the best of the chances, with Skrtel falling over 10 minutes into the second half, allowing Defoe to set up Adebayor but the former Arsenal man finished poorly, side-footing to Jose Reina. Skrtel then saw red after going through the back of Bale and moments later Defoe turned Jose Enrique and fired home his third of the season on 65 minutes. Two minutes later, Reina failed to hold a shot from Defoe and Adebayor followed in to make it three. The Togo forward completed his home debut with a second from the final kick of the match, lashing past Reina from close range. 90:00+4:04 The referee signals the end of the game. 90:00+3:48 Craig Bellamy takes a shot from long range which goes wide right of the goal. 90:00+2:46 Assist on the goal came from Benoit Assou-Ekotto. 90:00+2:46 GOAL - Emmanuel Adebayor:Tottenham 4 - 0 Liverpool Emmanuel Adebayor scores a goal from deep inside the penalty box to the top left corner of the goal. Tottenham 4-0 Liverpool. 90:00+1:54 Benoit Assou-Ekotto decides to take the corner short. 90:00+0:15 Rafael Van der Vaart has a lobbed shot. Save made by Jose Reina. 88:59 Sanchez Jose Enrique sends in a cross. 88:09 Shot from just outside the area by Gareth Bale goes over the bar. 85:36 Jay Spearing has an effort at goal from outside the penalty box missing to the wide right of the goal. 82:59 Substitution Sebastien Bassong comes on in place of Ledley King. 82:32 Substitution (Tottenham) makes a substitution, with Dos Santos Giovani coming on for Jermain Defoe. 81:34 Rafael Van der Vaart takes a shot from 18 yards. Jamie Carragher gets a block in. 79:58 The referee blows for offside against Jermain Defoe. Free kick taken by Jose Reina. 78:08 Effort on goal by Rafael Van der Vaart from inside the box misses to the right of the target. 76:31 Gareth Bale has an effort at goal from 30 yards. Sanchez Jose Enrique gets a block in. 75:30 Foul by Leiva Lucas on Rafael Van der Vaart, free kick awarded. Rafael Van der Vaart takes the direct free kick. 74:47 Gareth Bale concedes a free kick for a foul on Jose Reina. Free kick taken by Jose Reina. 71:06 The referee gives a free kick against Scott Parker for handball. Free kick crossed right-footed by Craig Bellamy, clearance by Gareth Bale. 70:34 Outswinging corner taken from the right by-line by Jordan Henderson. 69:26 Substitution (Liverpool) makes a substitution, with Jay Spearing coming on for Stewart Downing. 69:26 Substitution Craig Bellamy replaces Luis Suarez. 67:42 Shot by Jermain Defoe. Save by Jose Reina. 67:39 Jermain Defoe provided the assist for the goal. 67:39 GOAL - Emmanuel Adebayor:Tottenham 3 - 0 Liverpool Emmanuel Adebayor finds the back of the net with a goal from inside the six-yard box low into the middle of the goal. Tottenham 3-0 Liverpool. Correction - 67:36 Jermain Defoe takes a shot from 20 yards. Save made by Jose Reina. 65:11 Assist on the goal came from Rafael Van der Vaart. 65:11 GOAL - Jermain Defoe:Tottenham 2 - 0 Liverpool Jermain Defoe fires in a goal from inside the penalty box to the bottom right corner of the goal. Tottenham 2-0 Liverpool. 64:22 The referee blows for offside against Jermain Defoe. Free kick taken by Jose Reina. 64:05 Shot from 25 yards from Stewart Downing. Comfortable save by Brad Friedel. 62:53 Free kick taken by Benoit Assou-Ekotto. 62:20 Sent off Martin Skrtel dismissed for second bookable offence. 62:02 Unfair challenge on Gareth Bale by Martin Skrtel results in a free kick. 60:02 Free kick awarded for a foul by Younes Kaboul on Luis Suarez. Luis Suarez has a direct shot on goal from the free kick. 58:33 Emmanuel Adebayor takes a shot from 12 yards. Save by Jose Reina. 58:09 Shot by Luis Suarez. Younes Kaboul gets a block in. 56:55 The referee blows for offside. Jose Reina takes the free kick. 56:02 Shot from 18 yards by Gareth Bale. Save made by Jose Reina. 54:52 Free kick awarded for a foul by Sanchez Jose Enrique on Kyle Walker. The free kick is swung in left-footed by Rafael Van der Vaart, comfortable save by Jose Reina. 53:37 Effort from outside the box by Gareth Bale goes wide right of the target. Correction - 52:04 The assistant referee signals for offside against Luis Suarez. Free kick taken by Ledley King. 52:04 The referee blows for offside. Free kick taken by Brad Friedel. 51:34 Free kick awarded for an unfair challenge on Luis Suarez by Younes Kaboul. Direct free kick taken by Luis Suarez. 49:14 Jermain Defoe produces a drilled right-footed shot from 18 yards. Jamie Carragher gets a block in. 48:18 Luka Modric concedes a free kick for a foul on Jordan Henderson. Free kick taken by Jamie Carragher. 46:07 Free kick awarded for an unfair challenge on Andy Carroll by Ledley King. Jordan Henderson restarts play with the free kick. 45:39 The referee blows for offside against Jermain Defoe. Free kick taken by Jose Reina. 45:01 Substitution Rafael Van der Vaart comes on in place of Niko Kranjcar. 45:00+4:18 The first half comes to an end. 45:00+4:09 Booking Booking for Luis Suarez for dissent. 45:00+1:18 Corner taken right-footed by Luka Modric, Ledley King challenges Martin Skrtel unfairly and gives away a free kick. Jose Reina takes the direct free kick. 45:00+0:31 Free kick awarded for a foul by Leiva Lucas on Scott Parker. Emmanuel Adebayor restarts play with the free kick. 43:19 The referee gives a free kick against Luka Modric for handball. Direct free kick taken by Leiva Lucas. 42:02 Younes Kaboul produces a header from close range which goes wide of the left-hand upright. 41:53 Short corner worked by Luka Modric. 41:37 Shot from 12 yards from Jermain Defoe. Sebastian Coates gets a block in. 41:00 Corner taken right-footed by Luka Modric from the right by-line, clearance made by Jordan Henderson. 39:22 Luka Modric has an effort direct from the free kick, Sanchez Jose Enrique gets a block in. 39:22 Booking Booking for Sebastian Coates. 39:14 Free kick awarded for an unfair challenge on Emmanuel Adebayor by Sebastian Coates. 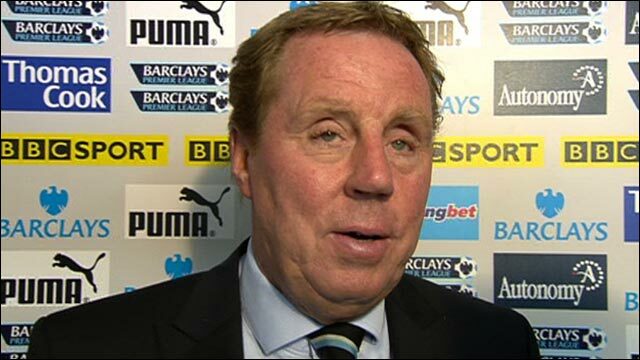 36:35 Niko Kranjcar has an effort at goal from 18 yards. 35:46 Free kick crossed by Luka Modric, clearance by Andy Carroll. 35:46 Booking Martin Skrtel is given a yellow card. 35:38 Martin Skrtel concedes a free kick for a foul on Gareth Bale. 35:25 The ball is sent over by Sanchez Jose Enrique, save by Brad Friedel. 33:17 Leiva Lucas challenges Jermain Defoe unfairly and gives away a free kick. Gareth Bale fires a strike on goal direct from the free kick. 29:27 The ball is delivered by Benoit Assou-Ekotto, Jamie Carragher makes a clearance. 27:39 Gareth Bale has a direct shot on goal from the free kick, Sebastian Coates gets a block in. 27:10 Sent off Charlie Adam is shown a red card for second bookable offence. 26:52 Charlie Adam concedes a free kick for a foul on Scott Parker. 26:24 Substitution Sebastian Coates is brought on as a substitute for Daniel Agger. 23:15 Jose Reina takes the direct free kick. 23:15 Booking Emmanuel Adebayor receives a yellow card. 23:10 Andy Carroll fouled by Emmanuel Adebayor, the ref awards a free kick. 22:05 Martin Skrtel is flagged offside by the assistant referee. Brad Friedel takes the free kick. 21:28 Ledley King gives away a free kick for an unfair challenge on Luis Suarez. Free kick taken by Charlie Adam. 21:01 Emmanuel Adebayor takes a shot from just outside the penalty area which clears the crossbar. 19:13 Emmanuel Adebayor gives away a free kick for an unfair challenge on Martin Skrtel. Jose Reina takes the direct free kick. 17:58 The referee blows for offside against Luis Suarez. Brad Friedel restarts play with the free kick. 13:18 Luka Modric has an effort at goal from 18 yards. Brilliant save by Jose Reina. 13:05 Shot from 20 yards from Niko Kranjcar. Jamie Carragher gets a block in. 11:49 Free kick taken by Ledley King. 11:49 Booking Charlie Adam goes into the book. 11:42 Charlie Adam gives away a free kick for an unfair challenge on Luka Modric. 10:17 The referee penalises Emmanuel Adebayor for handball. Sanchez Jose Enrique takes the direct free kick. 8:08 Unfair challenge on Sanchez Jose Enrique by Emmanuel Adebayor results in a free kick. Sanchez Jose Enrique takes the direct free kick. 6:22 GOAL - Luka Modric:Tottenham 1 - 0 Liverpool Goal scored by Luka Modric from outside the area to the top right corner of the goal. Tottenham 1-0 Liverpool. 5:27 Andy Carroll is ruled offside. Free kick taken by Brad Friedel. 2:25 Close range shot by Emmanuel Adebayor goes wide of the left-hand post.